If you need additional information send email to YOUR EMAIL ADDRESS. 1. What is Dhr2Believe All About? 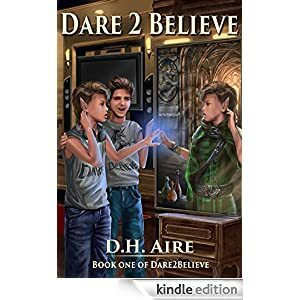 Dhr2Believe (Dare to Believe/Dhr2believe.com) is based on a series of unpublished novels and short stories that are the core plot and story arc of Highmage’s Plight, written and produced by the creator and owner of this website, George Bradley Dehr. George Bradley is the main character of Highmage’s Plight. The purpose of this site is to create a new kind of reading experience for those who love science fiction and fantasy. Through Dhr2Believe George opens Highmage’s Plight to you, taking you from being merely a reader, to become part of my circle of reviewers, and for those who register for an Exclusive Character one day, you will be the spirit behind your character – one who can reshape dialog, edit, add to the story, and eventually build on your character’s part of the story, with approval of the author, who seeks to keep the story arc and back story intact. Yet, Highmage’s Plight is an unfinished series… Through Dhr2Believe, together we will create new stories that go beyond the five current novels of the series. So, check out Dhr2Believe, join the quest… Dare to Believe and become part of the experiment. The stories serving as the basis for this website have never been published by the author and are copyrighted. The stories cannot be reproduced in any form without permission of the author, which are other than for the reader’s personal use. The stories on this website are intended to be viewed and read electronically by registered users. Other rights, however, will be fee based to allow members exclusive levels of interactions with the author, Registered Exclusive Characters members, or Author Level members through exclusive blogs and specific Facebook sites, among other benefits, in development which may be expanded over time. How do I link to the Interactive Serial Novel – Highmage’s Plight? To enter directly click: http://www.writing.com/main/books/item_id/1703925-Highmages-Plight—Dhr2Believehowever, once this site officially debuts, YOU WILL NEED TO BE A MEMBER OF WRITING.COM (Basic Membership is free) and you will need to sign up for the Dhr2Believe Group, for Highmage’s Plight which will have exclusive access to the site. A Passcode will also be provided to all members. The Passcode will change periodically, no less than quarterly, and be provided to all paid members. To join Writing.com click: http://www.writing.com/ To join the Group either put the phrase Dhr2Believe Group or “Highmage’s Plight'” in the search bar at the top of the Writing.com after login, then click on the item. You will then see details about the Group and need to send a post to the Group stating you are a member. Please identify yourself by your Dhr2Believe.com issued e-mail address from your Dhr2Believe registration (provided to all members). Are there any other benefits to membership? Beside the benefits outlined with Basic, Exclusive Character, and Author Level annual membership, participating on this experimental project will also offer Writing.com Gift Points periodically for member awards for “character development” activity, possibly member contests with the group, and occasionally for reviews of 250 words or more on any story or interactive story sidebar via Writing.com… You can earn similar gift points participating on Writing.com in general, which is a truly amazing tool for readers and those who would like to see what other people think of their poetry, novels, fan fiction, short stories and much more. (It is completely up to you if you want to upgrade your membership on Writing.com – you only need Basic Membership with Writing.com, which is free to participate in Highmage’s Plight – Dhr2Believe).